This post was inspired by a recent beer with long-term colleague, friend, and fellow volleyball dad, Paul Albright, now chief revenue officer at Marketo. Most companies simply market their current product capabilities: Here we are. This is what we do. Here are the benefits of using it. Wanna buy one? This is our current offering and it includes area 1 (which the other guy is pitching), but also areas 2 and 3, and the vision for our company is not just about having the best area 1, but instead to pursue a capstone vision that includes areas 1, 2, and 3. Ceteris paribus, who do you think wins? You do. Why? Because you completely enveloped the other guy’s message. You neutralized him on area 1, you one-upped him in areas 2 and 3 (even if your current offering is anemic on an absolute basis), and then you made the customer feel both more aligned with and safer buying from your company because you are pursuing the bigger vision. I call this a 3+1 repositioning. I did my first 3+1 repositioning back in about 1989 when I launched Ingres 6.3. Prior versions Ingres were just for data management, but with release 6.3 we not only improved data management, but added knowledge management and object management capabilities and introduced the vision of an intelligent database system. 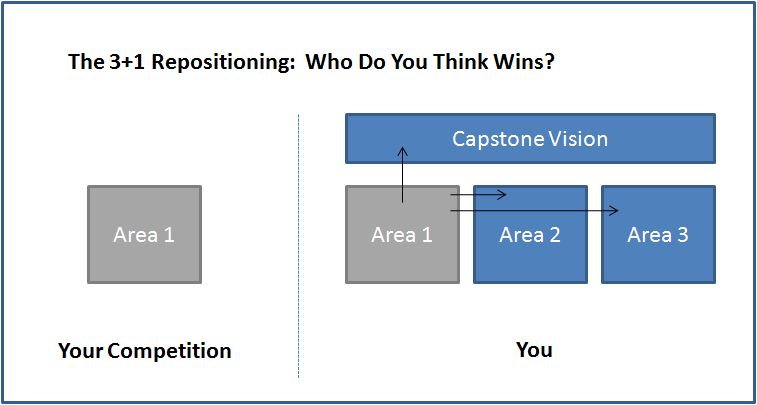 So area 1 = data management, area 2 = knowledge management, area 3 = object management, and the capstone vision was the intelligent database. While it was a well-executed launch, it was a long time ago, Ingres had many other problems, and the ending wasn’t terribly happy. Now let’s take a look at Marketo, a firm that I have traditionally thought of as about lead nurturing and incubation. It rallies your company, providing a North star towards which everyone can navigate. It can’t be done solely are a marketing exercise; it must be a company strategy and some resources must be invested in areas 2 and 3. You can easily oversell areas 2 and 3, ending up with disappointed customers. Remember the bear joke: you just need to run faster than the other guy, so don’t overset expectations. It can make your accountants nervous because there is a distinction between buying today’s product and buying into a (disclaimed) future vision and buying tomorrow’s product. The latter tends to have negative revenue recognition issues. In the end, I am a big fan of this 3+1 formula and encourage marketers everywhere to keep it in your toolbox.